Guest review taken from Google on 1/16/19 for Kiahuna plantation 170 This is a great management company that make your stay very easy to check in/out and respond quickly to your questions. The condo looked great and had plenty of items for the beach for your use. Highly recommend them. Gigi was terrific in resolving our confusion with the tv ---MANAGER'S RESPONSE: Mahalo, Mary! She will appreciate the kind comment! It was all wonderful. ---MANAGER'S RESPONSE: Mahalo, Mary, for choosing GVR! My experience with Aloha Great Vacation Rentals was wonderful and easy. The process was easy and they emailed over all the information I needed. They let us know they were available and always reachable if needed, however, everything was pretty much perfect and we did not need to reach out to them during our visit. They offer texting, which is very simple and convenient. ---MANAGER'S RESPONSE: Mahalo, Alexis! This property was perfect. Gorgeous ocean view! Located in a very clean, well kept, easy to find location. Walking distance to Poipu Beach, Brennecke Beach, and local shops and restaurants. One night we attended the luau at the Sheraton and decided to take an Uber, which was only a short $7 ride each way. I cant say enough good things about our experience at 101C. The condo was clean and comfortable. It is newly renovated and probably one of the nicest condos on the property. My favorite part was the large patio, where I sat out and watched the sunrise and sunset every morning/night, and laid out during the day. The neighbors who live right next door were a very sweet and friendly couple. It has a great pool with a nice view as well. We loved this condo and will definitely be returning! 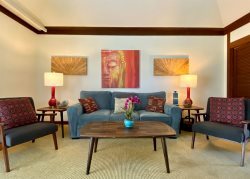 ---MANAGER'S RESPONSE: This Poipu Shores condo is a special one, completely renovated! We couldn't agree with you more! Thank you for staying with us and we will look forward to your return! All the GVR contacts were super helpful throughout the booking process and our stay! ---MANAGER'S RESPONSE: Mahale, Josh! We loved the welcome package, the unit, and the grounds at Kiahuna Plantation. The only downside, a very minor one, was the tub/shower needed a little TLC; it had staining and a loose shower head. ---MANAGER'S RESPONSE: We will definitely let our maintenance team know! Mahalo for the feedback! Guest review taken from VRBO on 1/17/19 for Pili Mai 15H Quietest, cleanest, best stocked rental weve ever stayed in Poipu We had no luck getting the wireless internet to work during our stay, but the property exceeded expectations other ways. Despite being right next to the road, traffic noise was never an issue. We only heard occasional footfalls from our upstairs neighbors, otherwise the units seemed very well insulated for sound. The kitchen was well stocked with everything from dish soap to spices to paper towels to plastic wrap to Tupperware. In the garage, we found good quality beach and pool items for the whole family to use. The bathrooms had more than enough soap, shampoo, conditioner, and toilet paper for our entire stay. The unit is easy walking distance to Poipu Shopping Center and Kiahuna Golf Course. Pool area was a definite plus, my kids especially enjoyed the keiki pool and hot tub. Parking and visitor parking in the entire condo complex was strangely laid out but not problematic in terms of unit access. I played text back and forth when we left some articles at our condo. the team successfully recovered them after those communications. ---MANAGER'S RESPONSE: We give praises to our housekeeping and office staff for staying on top of it! We may want to buy a condo, and maybe the condo we stayed in. ---MANAGER'S RESPONSE: That sounds awesome! We would love to work with you! Guest review taken from VRBO on 1/16/18 for Kiahuna Plantation 156 Beautiful condo lodging in awesome location Kiahuna Plantation has lovely manicured grounds, well appointed condos, and great access to world class beaches. I worked with both Janie and Gigi, both were extremely quick to respond to my questions, knowledgeable and friendly. Great customer service! Thank you ladies! ---MANAGER'S RESPONSE: Mahalo, Sandy! They're definitely both some of the most hard-working people we know! Fantastic townhouse that totally met our needs! We stayed for a week at Pili Mai 10e and what a great place to be! Situated on the lovely groomed greens of the golf course with fantastic sunset views. Townhouse was fully stocked, clean and met all of our needs. Situated in a convenient location, quick drive to shopping, food, beaches and more! We will be back! ---MANAGER'S RESPONSE: Pili Mai is such a lovely place! An updated luxury condominium complex that is still in very much close proximity to all of Poipu! We're happy you enjoyed the accommodations and will look forward to working with you, again! Team members were attentive and friendly. Whoever came to clean the condo as we were leaving was so down to earth and sweet. ---MANAGER'S RESPONSE: We appreciate it! So does our cleaner! Overall we had an amazing stay! Our only gripe was that we were not told the washer/dryer didnt work (we packed limited clothing) but we were reimbursed for laundry service at a nearby cleaning service. The view was to die for! There were multiple days we sat outside on patio and watched whales breaching nearby; it was mesmerizing. It was so convenient to have the pool just feet from our room. Sunsets were killer and we had a perfect view sitting outside on the patio chairs. Listening to the waves at night was like a magical lullaby. The beach was a short walk from the home. There were plenty of towels and utensils and soap/shampoo. We felt very welcomed. Would love to return!! ---MANAGER'S RESPONSE: We apologize for the sudden inconvenience that you faced, it's never an ideal situation when a key appliance goes down. We're glad we were able to assist you with your laundry and that it did not hinder your experience on Kauai! We will continue to work with maintenance and do our best to keep appliances in top shape. Mahalo, Pati! Guest review taken from Airbnb on 1/14/19 for Villas of Kamalii This home is clean, clean, clean and comfortably accommodated my family of five. It had everything we needed to feel right at home. I would highly recommend staying here if you want a quiet stay while still being very close to a bunch of amazing North Shore attractions. Eg: Hanalei Bay was a 5 min drive and Queen's Bath was only a 3 min drive. There was also a grocery store, Foodland, that we stopped at countless times to either pick up a quick breakfast before an early hike or ingredients to take back to cook dinner. All in all, this was the perfect stay for my parents' retirement trip. Guest review taken from Airbnb on 1/11/19 for Kiahuna Plantation 108 Beautiful property, convenient to beach, cute coffee house, Starbucks and cool restaurants. Poipu is a magical area of a magical island and this property sits in the heart of it convenient to everything. King bed and room is comfortable, but pull out couch is all springs and center bar. Perfect for two! Guest review taken from Airbnb on 1/14/19 for Pili Mai 11D We had a great time and loved the space we had! The condo was perfect for our family of 5 + mother-in-law (3 adults a 6 week old, 3 year old and 16 year old). Plenty of room and super clean! We will be back! The staff was awesome. They communicated very well and gave us all the info we would need for our stay. ---MANAGER'S RESPONSE: We do our best to make the process as smooth as possible! Even though our washing machine was broken it wasn't enough to put a damper on our trip. The property was fantastic, not a single complaint. ---MANAGER'S RESPONSE: Mahalo, Brian! Glad you had a great time! Guest review taken from Airbnb on 1/13/19 for Poipu Shores 101a This place is a bargain in a very expensive and interesting beach area. The furniture is fine and in good shape, the kitchen was equipped well enough to let us actually cook when we wanted, and though the whole unit wasn't gleaming like an expensive hotel room but it was definitely clean. The ocean really is crashing right outside your door, like it's looks in the photos, which was great, though the place has a smaller feel than you get from the photos, but it was big enough for us, two adults and two teens. The exterior is a little worn and rusted, but the interior is in fine shape. It is not very easy to find the complex from the street, nor the unit from the parking lot, especially at night, but texting with the host, a management company, was the great asset of this rental. They were super helpful -- responding quickly, warmly, enthusiastically, accurately and helpfully to every request. They helped us arrange an extra day with the car rental, helped us find the place, find things in the unit, mailed us medications we left there by mistake, everything. Although we never met or even spoke on the phone, they colored our whole experience there and we are very appreciative. If you need anything, text them. Guest review taken from VRBO on 1/13/19 for Kahala 132 Great family lodging in excellent location! The condo was great for our family of 4. Having the loft for the kids got them, and their stuff, out of the main living area. The master suite was spacious with a very comfortable bed, and good cross ventilation kept it cool in all but the hottest weather. We stopped at Costco and loaded up, so did a lot of cooking, and the kitchen was very well appointed. The communication and level of service by Great Vacation Rentals was truly outstanding. From Pre-trip communication, to rental car upgrade, to troubleshooting minor issues that came up, to help with itinerary and communication during our stay, they were truly excellent. We may opt for a second bathroom on our next trip, but would stay at a GVR managed facility anytime and heartily recommend Kahala 132. Guest review taken from VRBO on 1/13/19 for Poipu Palms 302 The stay at this Location was great! The stay here was great! Key pickup was straight-forward and hassle free. Parking was good - both open lot and under cover. A map to the location was included with the key - getting that map before arrival would have been nice. The suite was clean and in very good condition. Kitchen was well stocked with all the things youd expect. Bathrooms the same. View from the balcony was superb. Saw whales and turtles from the balcony frequently. Whenever we ate in the suite we ate at the table on the balcony. WIFI and all the electronics were in good working order. WIFI was much better than anticipated. All phone calls and communications with the booking group looking after the suite was smooth. All questions answered fully and promptly. Great service, very nice suite, superb location and view. Id return to the same location again without a second thought. Guest review taken from Google on 1/10/19 for Pili May 15J The Condo was perfect for our stay. Everything was in order and it was simple to settle in with the instructions and directions. We were extremely comfortable and the location was the best we could imagine. Of particular note were the staff members at Great Vacations Resorts. They were exceptional in their customer service and quickly resolved any issues that arose. I wish I could give more than 5 stars to them. Guest review taken from VRBO on 1/13/19 for Manualoha 609 Fantastic Location, Great View, Perfectly Managed I stayed here with 3 other adults and my 6 month old baby. First off, the management company is fantastic, they responded immediately with any questions and made upgrading our rental car to a larger SUV very easy. The house had everything we needed in the kitchen (foil, spices, ziploc bags, etc.) to cook a meal at the community BBQ that's right outside the unit. They also had all the beach supplies we needed (4 chairs, multiple coolers, big beach umbrella, buckets and shovels) We rented a wagon and walked the 10 minutes on the paved walking trail to Brennecke and Poipu Beach. We saw turtles every day and Brennecke's Beach Broiler, the only restaurant in 10 minute walking distance that isn't part of a hotel, is awesome and reasonably priced. We paid the $100 to be a part of Poipu Beach Athletic Club and were very happy with our decision. It was nice to go to take the 5 minute drive to their pool when we wanted to get some sun and take a dip without doing the whole walk and beach set up. Their restaurant on site is also delicious and reasonable, without the crowd or wait at Brennecke's. We walked to Shipwreck Beach and the Hyatt resort from our unit one day, it took about 20 minutes but has a dedicated pedestrian path the entire way so you don't have to walk on crowded streets. The unit is great and the pictures do a good job displaying the layout. We watched sunsets from the Lanai off the living room and the lanai off the master bedroom upstairs had the best view of starts we've seen in a long time. The only drawback is since the upstairs bedroom is a loft, when we had our baby sleeping up there, we had to be mindful of noise when hanging out in the living room/dining room. Minor issue but something to think about if you have little ones that are sensitive to noise. Same is true of the bedroom downstairs because the doors aren't solid, they have slats and screens on them. I'm pretty sure the reason it's a loft upstairs and they don't have solid doors is to help the breeze come through, so it has a reason. Overall, definitely 5/5 stars, we will definitely be back. Guest review taken from VRBO on 1/14/19 for Kuhio Shores 208 Delightful condo with great waterfront location Everything worked perfectly here--easy check-in (could even be done in the dark, if you arrive late), well-designed condo with all the amenities you need, and all in good order. Perfect for two people or a family with small kids. We watched turtles in the morning from our balcony feeding on the rocks below us. Easy parking, convenient location to get anywhere on the island. We'll be back. Guest review taken from VRBO on 1/14/19 for Kuhio Shores 201 Great place for vacationing & beach time Great view of the sunrise and sunset plus walking distance from the beach. Clean, comfortable, and close to the promenade with excellent restaurants and convenience stores. Laundry facilities on site were helpful as well. Glad to have found such a great spot to relax. See above remarks under expectations. The house met expectations with regard to location, but failed completely our expections regarding cleanliness and condition. ---MANAGER'S RESPONSE: Mahalo for the feedback, Stuart. We have shared your message to our management team who will work with the cleaners and maintenance technicians to address the issues you outlined. We take your feedback seriously and will do the best we can to keep the house in top shape for guests. Again, Mahalo, Stuart! GVR is fantastic! The entire experience was as smooth as it could possibly be. Anyone considering a stay on Kauai should definitely check out GVR! The property has everything thats needed for a fantastic vacation! Its convenient to everything, is very clean, and feels very much like home away from home!